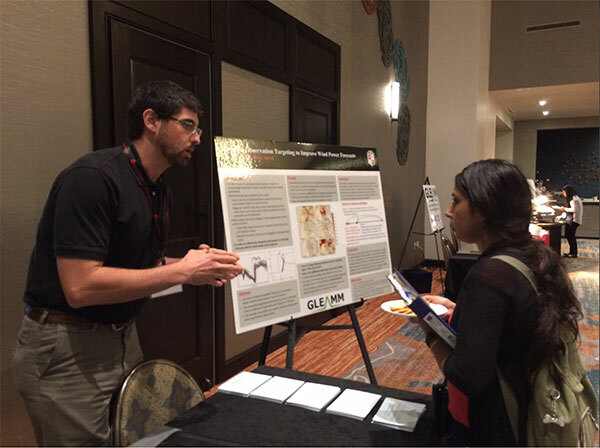 Texas Tech researchers recently were represented at the Texas Renewable Energy Industries Alliance’s annual conference, GridNEXT. The conference, held November 9-11 in the 100% renewable Georgetown, Texas, showcased seven winners from Texas Tech’s GLEAMM Challenge held in September at the Innovation Hub at Research Park. On display in Georgetown were TTU innovated technologies and partnerships in the field of renewable energy and grid modernization. Everything from an ensemble weather forecasting technology to a heart rate occupancy sensor were showcased. During the conference, TREIA held a reception individually showcasing and honoring each of the projects and technologies. Throughout the conference, the teams were able to network with over 200 industry attendees and draw significant outside interest in their projects. The Global Laboratory for Energy Asset Management and Manufacturing (GLEAMM) was established at Texas Tech thanks to an investment by the State of Texas. Texas Tech is leveraging this investment to test, certify, research, develop, and support the manufacturing of new electrical grid technologies and next-generation power electronic devices for public and private partners. Likewise, TREIA is a network of project developers, corporations, financial institutions, end users, utilities, manufacturers, service providers, academia, and government leaders working to scale renewable energy, grow the local economy, and create jobs. Texas Tech and GLEAMM will continue to work closely with and partner in TREIA. The TREIA Executive Board was able to attend the September GLEAMM Challenge and serve as judges within the Challenge. In addition, the director of GLEAMM, Dr. Annette Sobel, spoke and was honored at the GridNEXT conference. “Radar-Based Occupancy Sensor for Commercial Buildings” developed by Changzhi Li and Yiran Li. The technology is currently licensed to yearONE, LLC, a Texas Tech startup housed in the Innovation Hub at Research Park. “Magnetic Field Imaging Device Utilizing a Hall-Effect Magnetometer Array” developed by Shelby Lacouture, Argenis Bilbao, and Stephen Bayne. “Adaptive Observation Targeting to Improve Wind Power Forecasts” developed by Nick Smith and Brian Ancell. “Integrated Motion Sensor for Solid State Lighting” by Changzhi Li and Yiran Li in partnership with yearONE, LLC. “Advanced Control Development for Fuel Cells” by Michael Giesselmann, Stephen Bayne, and Argenis Bilbao in partnership with Doosan Company. “Professional and Advanced Testing Capabilities for Innovative Wind Technologies at Reese Technology Center” by Carsten Westergaard, Suhas Pol, and Ricardo Castillo. “Commercialization of the TTU Weather Prediction System” by Brian Ancell in partnership with Group NIRE, LLC. The next GLEAMM Challenge is scheduled for the spring at the Innovation Hub at Research Park.